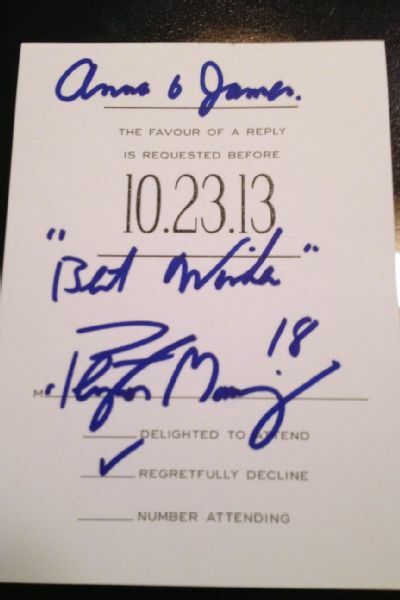 Perhaps the sure way to secure an autograph from Broncos quarterback Peyton Manning is to invite him to your wedding. Sounds more tidy than playing the post-game waiting game or bidding beau coup bucks on a signed jersey during a charity auction. In the case of Anna and James, a couple with a wedding last fall, all they had to do was send No. 18 a formal invitation, according to a post on Reddit. 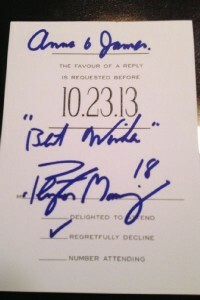 A photo of the signed invite went viral after a Redditor “Lackadaisical Romp” posted the pic of the wedding invitation sent by his sister.